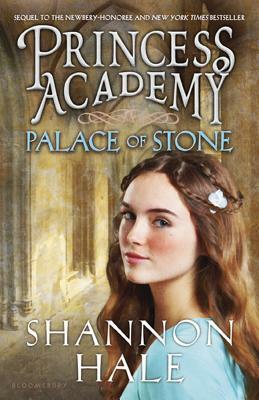 Princess Academy and Palace of Stone by Shannon Hale. 2007 and 2012. Bloomsbury. Currently Available. Face Value: These covers aren’t that appealing to me. While I like very much that we see an actual girl that could be Miri based on the physical description, and certainly appreciate that we see her whole face, the images on the covers don’t tell us much. The thing is – these books are so much more than they present to the world. You wouldn’t know, just from the covers, that you’re actually getting a complicated pair of stories about social classes and power and political revolution? But maybe that’s a good thing. Even a great thing. Because these books also look marketable. One only has to go any place where items are marketed to girls to know that princesses have selling power. Read Peggy Orenstein’s fabulous book Cinderella Ate My Daughterfor a fascinating look at the way Princess Culture is marketed to girls and women. But within that Princess Culture, these books have real potential to make it into a lot of hands. And once that book is out there, it’s giving its (frequently young and female) readers a really important point of view. That seems both subversive and Slatebreaking. Does it Break the Slate? This set of books would shatter a slate, even if it were made of linder. Miri is everything I could wish for in a Slatebreaking heroine – thoughtful, smart, brave, compassionate and willing to confront insurmountable obstacles to make life better for herself, her family and her community. But let’s be real, it’s not just Miri – any of these Mount Eskel girls could shatter a slate without thinking twice about it. Frid could do it with her bare hands. Katar with her ambition. Esa with her thoughtfulness. Shannon Hale has given us a dynamic cast of female characters who are insanely deserving of the Slatebreaker title. But both of these books offer the reader more than just Slatebreaking characters. They give us a Slatebreaking worldview, encouraging its readers to think critically about power dynamics, systems of social classism, gender disparity and ethics. Who would we give it to? Lots and lots of readers. This duo, as well as Hale’s Books of Bayern, would be first on my list for the fairy tale lovers, or kids who have read books like Ella Enchanted and loved them. Also, see my above comments in the face value section about how this book is going to plant big ideas in a lot of minds. Review: This is the first time, for me, that I’ve reviewed two books in one review. But having finished them both within the span of a couple of days, I felt that I had more to say about the two books in conjunction with each other. But be warned – if you haven’t read Princess Academy, the fact that I’m reviewing Palace of Stone alongside it means that, while I’ll try to be as vague as possible, there are going to be unavoidable spoilers for the first book in this review. So choose wisely, if you’re going to read on! Like in the Bayern books, Shannon Hale has created an alternate fairy tale reality. It exists within the standard “long ago and far away” concept, with no specific link to a historical or geographical moment we could tie to our own world. I like this because it means we don’t get hung up in details, but Hale’s attention to detail makes us feel comfortable in the fully realized fantasy world surrounding us. In Princess Academy we are introduced to Miri, a 14 year old girl who has grown up on remote Mount Eskel with her father and sister. Her world changes when news comes from the “lowlands” that the prince has been decreed to marry a girl from Mount Eskel. All the girls then, are put into a “princess academy” to learn everything they might need, from reading to poise to diplomacy. What ultimately happens is a compelling exploration of political and personal repercussions. The girls of the academy, now armed with knowledge, are able to advocate for themselves and their community on a much wider scale. In the end, it’s much less about who marries the princes and much more about how young people – young women – can affect positive change in the place where they live. Palace of Stone, goes even deeper, politically and socially, than Princess Academy does, pushing both Miri and the readers to think on a larger scale about what privilege and power really mean, and what one person is capable of when it comes to revolution and change. In this book, Miri and the other girls have left Mount Eskel for the palace, studying at the university and staying in the palace as ladies of the princess. But amidst the city she’d dreamed about, Miri finds herself caught up in the political landscape, as the poor, known as the “shoeless” are moving towards revolution in protest of unfair treatment. Caught between royals and revolutionaries, Miri has go figure out how to stick to her principles and stand up for her beliefs on a much wider scale. The book is satisfyingly complex in its treatment of these giant issues (with significance, needless to say, in our modern day, non-fairy tale world) while still building towards a happy ending. What both of these books focus on is the theme of knowledge and experiences changing you. Once your world expands, you can’t go back to the person you were / life you had before. 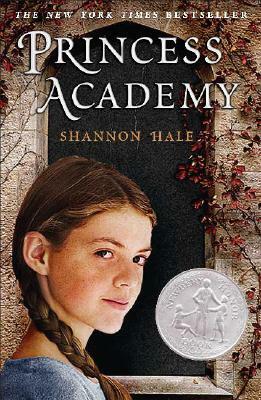 We see this in the first book – when Miri and the other girls learn to read, about the world outside of Mount Eskel, and about their own potential status in Danland’s economic landscape, they can’t simply leave the academy and go back to the lives they had before. Their knowledge has a ripple effect, that transforms their whole community. And in Palace of Stone, once the girls have experienced city life and all that it has to offer, they can’t return to Mount Eskel the same girls they were when they left, for good and for bad. It’s Plato’s Allegory of the Cave, but it’s also incredibly personal, painting a portrait of how wants and needs change as people change. Hale doesn’t oversimplify this with a magical solution, instead her characters have to decide which parts of their lives will be prioritized in order to be happy and complete. Even the characters for whom the decision is straightforward (Katar, for example, doesn’t question her desire to leave Mount Eskel), have complex layers to their pursuit of happiness. As readers of all ages, it’s a fantastic takeaway. The more we learn, the more experiences we have, the harder it is to balance all of the things that make us who we are. But it is possible. And expanding our worlds can never be a bad thing. Shannon Hale, the author of these books as well as many other books (including the insanely brilliant Goose Girl and Enna Burning, two of my favorites) has a strong online presence, on twitter and her blog. As someone who writes about gender in YA and children’s literature, I’ve definitely taken notice of her writing about readership, and what constitutes a “girl book” or a “boy book.” She has a lot of smart things to say, including some insightful commentary on how social expectations play into what girls and boys are expected to read and enjoy. I was totally devastated to miss her appearance at Changing Hands, my local independent bookseller (stupid work conflicts) last month, and I really hope that she plans to return so that we can talk to her about some of these things in person! Shannon, thanks for being a Slatebreaker, and for writing about them! We can’t wait to read what you write next. Both books reviewed from library copies. This entry was posted in Middle Grade, Reviews and tagged Ethics, Fairy Tales, Mount Eskel, Politics, Princess Culture, Princesses, Shannon Hale. Bookmark the permalink.